My Summer clothes are getting an enormous workout, and I thoroughly enjoy the variety of my Summer style. I LOVE my new dresses, tops, skirt and shoes. I'm thrilled I stocked up early in the season because most of it is gone in my size. AND I've duplicated the winning footwear. Here are my 2018 HIGH Summer wardrobe workhorses. Please post yours too. (New blue stripe NAS dress is an anticipated workhorse - am wearing it to work today). 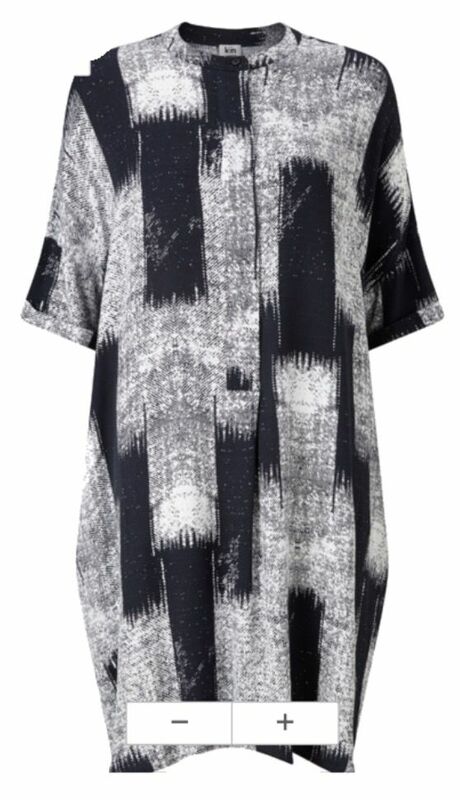 ETA: I wear the short black Zara dress OVER the black pants as a tunic. 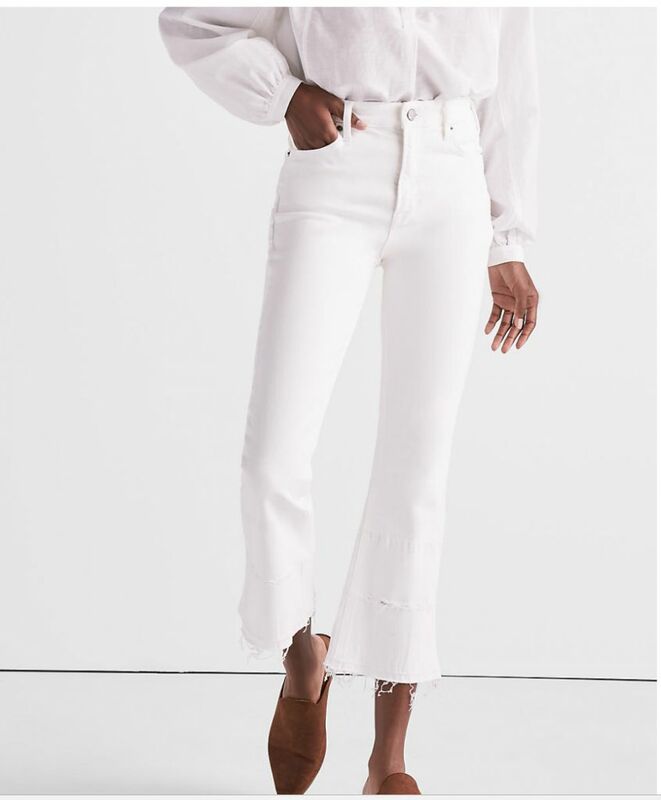 The blue ribbon item for this summer goes to..... white Lucky brand Bridgette cropped jeans. I would guess I've worn these at least 2x a week since they arrived -- comfortable, trendy (in a good way), and easy to wear. @Smittie: I think you were the first to post these. I owe you a million. They're amazing. I've also worn this striped Zara top a number of times. It's comfortable and stylish, and the yellow stripe adds a trendy zip to an otherwise classic shirt style. And it needs no ironing. Go Team White Jeans and Blue Tops, Viv. High five. NICE. It's been a hot summer here as well and I am living in my dresses. Right now, it is too hot for polyester so my Topshop dress is on a rest and it is Boden and my J. Crew 2 piece dress all the way. I am just the opposite, Angie. This hot and humid summer is dragging me down. I feel sluggish and drained. It’s hard to motivate myself to do much outdoor activity when it’s already 80 degrees and 90% humidity when I wake up in the morning. I think I need to spend my summers in the PNW from here on out. 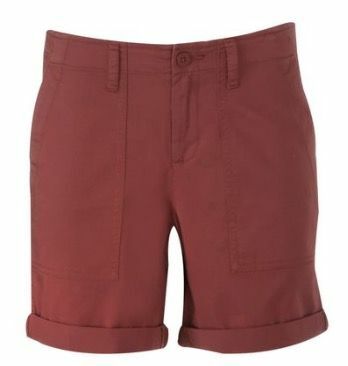 I have continued to turn to old reliable casual pieces — shorts and tees and sandals — yet again this summer. Most are quite basic and not very exciting, but they work — and looking through this, I am realizing how many pieces I have been wearing for years. I am glad I could add a couple of dresses and skirts this year. It's been a hot one that's for sure. I've been living in denim cut offs (rolled) and other shorts - not in my Finds though. Here are a few other things I've been wearing a LOT. No time for finds or photos right now, but chiming in to say your summer wardrobe looks so great, Angie. Very enviable. It's been a hot and often humid summer here too, and I'm waning. Well, no, already waned. Lol. Workhorses have been an Everlane blue and white striped shirt dress, an olive linen sack dress (not very polished though, but it's what I have) , lightweight cuffed khakis, and lightweight jeans in white and light blue (Pilcro and Gap) . My fitness /health facility job wardrobe has no bearing on season or weather - ha- and is all MPG lightweight joggers, fine gauge knit tops, and a bomber jacket or drapey cardigan. I ended up having a notable hole this summer for nice tops to wear with the aforementioned pants - and am letting it go for this year, but will need to fix this for next summer. Glad you have proper summer weather Angie! Outside of a busy season at the office we've been spending as much time as possible at the lake and on the boat! Loose and easy has been the winner this summer. Oh well. 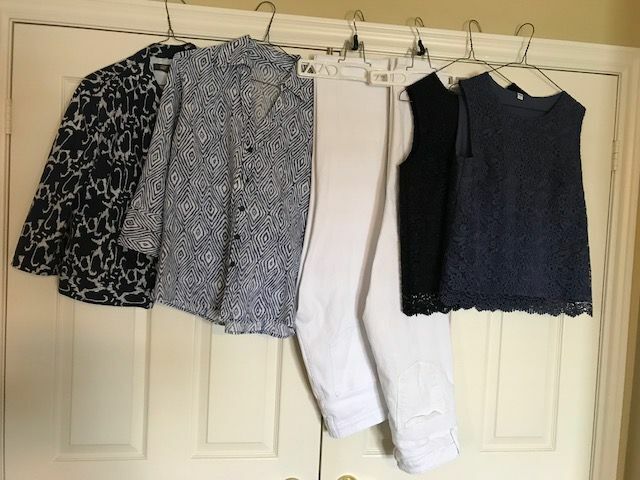 While I am well equipped for the standard middle European summer of 75F this over the top hot summer of approx 6 weeks with about 95F has put only three "outfits" in heavy rotation. I do love them dearly but I am SO SO ready for a change. First is a dress from a brand called Kiin. I think it's an inhouse brand from John Lewis London and I bought it three years ago at Heathrow airport of all places. I call it my tent dress because that's basically what it is. A big huge tent. But I like that it covers me up appropriately for the workplace and is still very breezy. 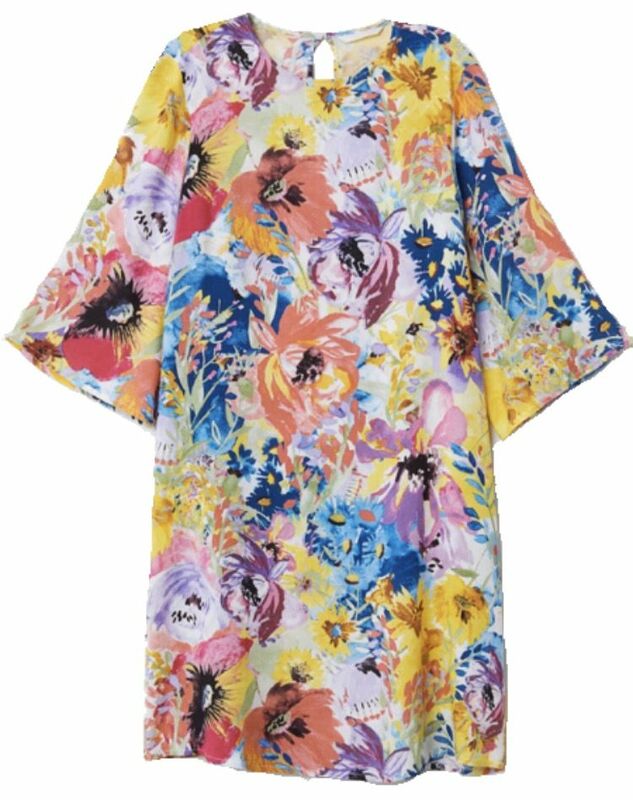 The second one is a simple dress from this years h&m and although it's a tad short I love the colors and plan to wear it as a tunic later in the year. Last is a EF linen skirt which I bought at steep discount last year in London (sadly haven't found EF here in Germany yet) and my favorite uniqlo summer shirt that I bought three of when I couldn't wash the one I first had fast enough. Add to that my white FLORIDA Birkenstocks (3straps). Happy feet every day. LOVE SEEING YOUR SUMMER STUFF, ladies - especially the dresses, white jeans, skirts, and colour! Ah I love all your summer goodies. I see you duplicated the BR watermelon flats in red ? So fab ! I'm with Janet, I don't function well at all in the heat;-) So I'm thrilled that it's a whole lot cooler today after last night's thunderstorm. Dresses, tube skirts, an old Gap popover shirt and my Birkies have been lifesavers this Summer. (I wear the short-sleeved dress at home only because it's nearer to mid-thigh length with big side splits that reveal a lot while walking - lovely and breezy for the hot flat though;-) The light-weight maxi cardigans are super handy for layering (not that I've needed them much these last two months). It's always hot in Texas, but this summer has been extra. Dallas recorded three days in a row at 110F a couple weeks ago, and it's not a dry heat. Today we're getting a "cold" front that will drop our high temperatures from around 100F to the low 90s for a couple days. Plus rain chances. This is great cause for celebration! I feel like I'm making a confession, but I've been basically living in Amazon knit dresses. I love the colors and the fit is great on me. I also added a white long-sleeve shrug, which takes care of me in the A/C. Plus the white Rockport sandals and hats, and I have a formula that keeps me as comfortable as possible. Minimal jewelry, hair up, and a hat for outdoors. For a change I may wear jean shorts and a graphic t-shirt, and some different sandals. And always my awesome Patricia Nash saddle bag. Anchie: I love your striped Zara culottes!!! Everyone’s summer style is looking fabulous! It’s been a hot one here as well, and I’ve been living in my me-makes. Me-made shorts with either a graphic tee or one of my J Crew Factory tees, and some me-made dresses and skirts. Oh how I wish these summer days would never end! I've really been doing dresses and skirts a lot this summer. Red, pink, lilac and light blue are in heavy rotation. Renewed my love of maxi skirts this summer. One older gray print and one navy with bold mint green geometric print. Also my ancient maxi dresses. I strongly prefer them on the hottest days. I am tired of my older dark much worn cropped pants and tops, although they got a lot of wear. I live in my sandals. Also enjoying my new EF dress worn with an old black open crochet sweater. So many pretty things! The dresses are so on point this season. And everyone have a stunning collection. Like everyone in most of the us, it’s been a beastly hot and humid summer. When I’m not coated in popsicle juice, I try to stick with cottons and linens in loose shapes. I have been trying to wear the heck out of what I bought this year. Mostly old navy with a smattering of Massimo Dutti. Cons, Stan smiths, espadrilles and flip flops. Summer? What summer? It's been in the high 60s/low 70s where I live, and for me that's not warm enough for bare legs and sandals -- what I consider summer clothes. Granted, I work once a week in the South Bay where it's usually in the 80s, but that's work clothes. Tonight, we're going to an outdoor comedy festival that is supposed to end around 9 -- when it will be in the high 50s. I am still hoping to get a bit of summer weather (which will mean cooler temps for the rest of California, something they really need), and we still have September and October which are usually the most fog free months. I bought a big window fan to replace the partially broken one early in the season. I know that's what triggered the cooler weather. DonnaF - I have 3 of those Caslon cardigans. They are great for indoor a/c! I have a really hard time with any temps over 90° F, even with our low humidity. Not having AC makes my summer afternoons completely unproductive. I turn into a sweaty, grouchy mess. That said my summer workhorses are mostly skirts, sleeveless tops, and anything linen. These are all items I've worn or am on track to wear at least ten times this season. (The gladiator sandals are new, but I'm still on track to wear them 10x... they're replacements for my worn-out Bed Stu sandals). My summer work horses have been my olive shorts, denim skirt, olive utility jacket, and three dresses (J Jill, Athleta, and Loft). I have many other summer selections that I'm enjoying for work, but these are the items that I find myself grabbing these over and over again for evenings and weekends when I have had to face the heat more. The J Jill floral dress has been my standout selection -- a jersey knit with perfect non-clingy drape that washes very well. I throw it on after a work out, add my purple Noat Kayla sandals and am ready for the rest of the day. I have been rocking new-to-me columns of color, in white, navy and olive. I have avoided this style all my life because of my height (already statuesque enough, and then some). But I love how elegant and put-together it makes me feel! I have also been living in white jeans! To think I waited 32 years to own a pair! They are so crisp and fresh and summery. 3 honourable mentions: I wore so much black before I retired, that I'm seriously off black for the moment. However I have had the Zara embroidered bomber (2+ years) out a few times. Also, 2 pair of hacked/cropped jeans that you have seen a million times have just been permanently retired after being worn to death. My hats - just plain obligatory due to +++ sunny days. Here’s what I’ve been wearing this summer. Viva: I’m so glad the jeans worked out for you. They’re working really well for me too. I have three summer workhorses, one is not pictured below. 1. Eric Javits bag - this medium large bag is the perfect tone of blue to coordinate with my wardrobe. The size is great for my workday when I carry all sorts of stuff including sunglasses, two cell phones, a large set of keys and web tokens, my inhaler, lip gloss, and sometimes work related notes and letters. There’s even room for a small water bottle and a compact umbrella on rainy days. I have only switched into a smaller bag for weekend errands because this bag worked with everything. 2. Halogen linen sweater- I love the fine knit and refined look of this sweater. It doesn’t wrinkle, so it looks polished. It works with dresses, jeans, or trousers. The color is cheerful and makes me happy. It is just right for keeping off the chill from a/c without causing me to melt if I need to run outside unexpectedly after a rambunctious kid. 3. Cole Haan sky blue patent leather sneakers. I wore these so much that when I saw they had gone on sale, I purchased a back up pair. 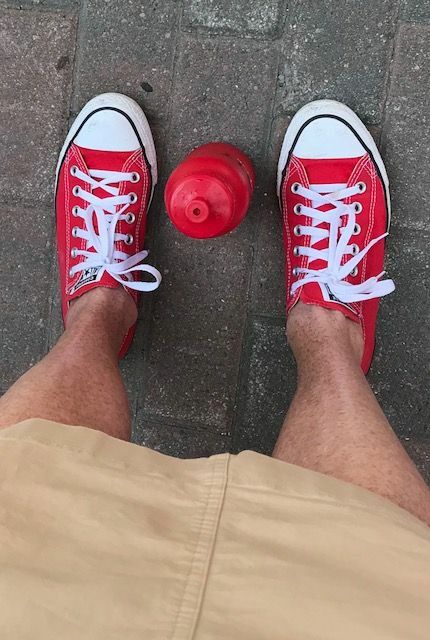 I love the color and comfort of these shoes. They are casual, but they have ribbons for laces which makes them a bit more dressy. I wore them when Toban and I met, so they are in that post. I wear them 1-2 times per week. Also in the midst of a wicked heat wave here, even though I am not far from the coast. I am living in my work dresses and casual dresses (weekends). I recently added the cream eyelet dress for work and the BR denim peplum blazer has been a workhorse/wild card this summer! It even accompanied me on vacation in France.